I am a researcher. A Googler. I’m not afraid of the unknown as long as I have a working internet connection. Conversely, waiting for answers to important questions and not being able to Google them right away makes me absolutely bananas. One of the prettiest places in town – especially in the autumn. 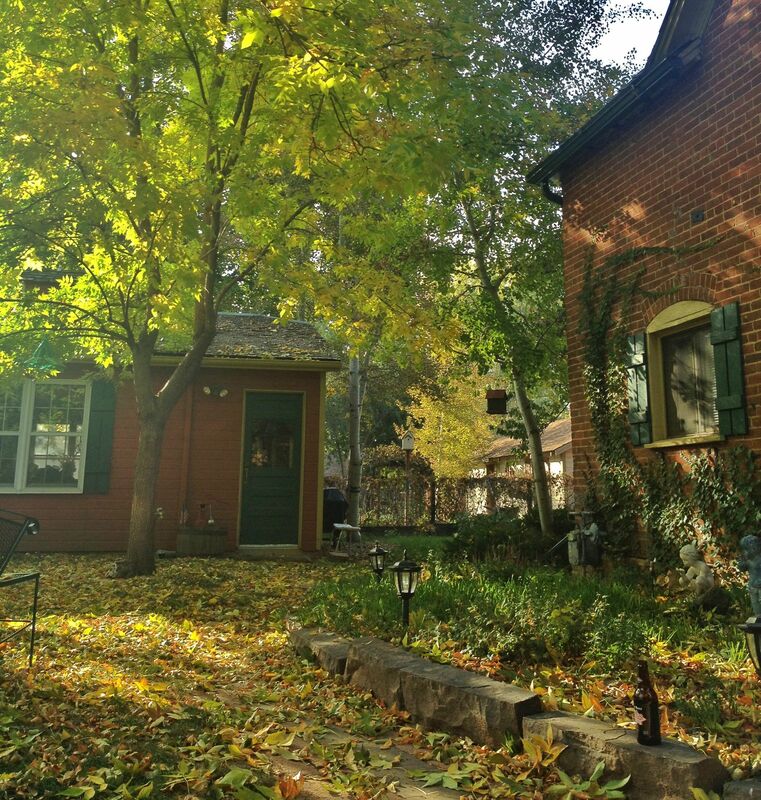 My husband, Jason, and I are currently waiting to hear back on the plethora of tests and checks we’re having done on the beautiful 1890 brick carriage house Jason’s grandma -and grandpa before he passed 10 years ago- lived in for over 20 years. Jason’s grandma, Eileen, had some scary health issues at the beginning of 2012 and she had to be admitted into the hospital/rehab for months. While she was recovering I volunteered to care for her yard so no one had to think about it while the 4 siblings all worked on getting their mother healthy. Unfortunately, as Eileen’s health recovered through the summer, her memory has declined substantially due to the many seizures she experienced during her illness. Unable to remember if she has taken her pills 3 minutes after she takes them has forced the family to admit her to into a senior care facility. …and now her beautiful home, which her love and tasty cooking made so inviting and warm, sits empty and the elements are starting to take over – and I, after caring for it all summer, am so smitten with the place that I can’t see my life being lived anywhere but there. I want to keep her home alive and happy and lived in. I can see our Christmases, our summer BBQ’s, our niece playing in the massive leaf piles in the autumn… I can see our history unfolding there and my heart aches at the notion that another family might take over, or worse, a contractor will buy the land and tear down the house to make room for condos like they did on the other end of the city block. When Jason and I started dating I was only 15 years old. Even at 15 I fell madly in love with the house the moment I laid eyes on it. The lot is a sprawling 1/2 acre on the edge of historical downtown Loveland, Colorado. The lot is populated with huge trees and bushes of beautiful roses. The house itself used to be the carriage house where the horses and blacksmith resided, and the original home sat on the South end of the lot; a veritable mansion built during one of Loveland’s first big waves of incoming settlers. If the stories I’ve been told are correct, that main house burned down in the 1960’s and no one ever repaired it. It sat unloved and hauntingly filled with nocturnal creatures for almost 20 years. The family that owned the lot decided to scrap the mansion in the early 80’s and convert the carriage house into a livable space. George and Eileen bought the home soon after. There are so many things to think about with such a vintage home! Asbestos, Radon, roof replacement, electrical updating, the constant smell of natural gas; all items that could be deal breakers if they come back with nasty results. So far, the electrical has come back as updated but not great (needing a $700-1.3k upgrade); the Asbestos came back negative on all samples except a ‘presumed’ positive on the plaster behind the drywall since we couldn’t get to enough sample spots to rule it out (which is absolutely incredible in such an old home!). We’ll hear back about the gas, roof and Radon early next week and I’m about ready to explode with anticipation. For now I’m trying to keep myself preoccupied with this new blog and with preparing all the paperwork to allow us to rent out our house if we end up buying gma’s place. That’ll be another huge project in and of itself.